Stops pain and inflammation, promotes healing and wellness. • EMpulse technology is safe and has never had a reported side effect. 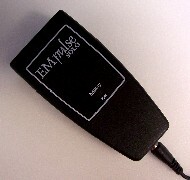 • The Empulse is a hand held device. Weighs two ounces and can be used at home, in your car, or battery powered. 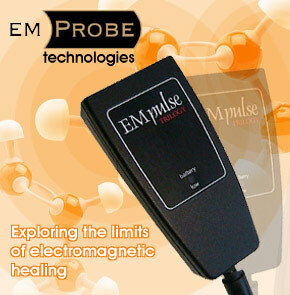 • Empulse is vastly superior to "light" or "static magnets" at a very competitive price. • EMpulse heals injury and relieves pain - proven by NASA. To order more than one item, click "Continue Shopping" from order page and click ADD TO CART again. The 120volt AC Transformer included with your EMpulse works fine, although in European countries you may need to get a converter. 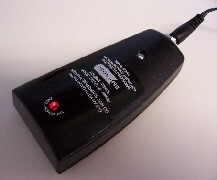 Use the 9v battery case power supply, so you don't need to worry about the cord and can be more mobile. The case is supplied with an attachment band that can be used to attach the battery case to the EMpulse on either the side or the top. Be careful to not cover the low battery indicator light with the band when attaching. When using the battery case, we recommend purchasing rechargeable 9 volt batteries for maximum efficiency and less cost. You can purchase 9v rechargeable batteries and a charger at your local electronics or department store. Dr. Gordon, MD, is the inventor of EMpulse. He is an international Sports Medicine & Rehabilitation expert, and has devoted over 20 years of R&D to PEMF technology. In 1982 Dr. Gordon was the first to propose nanosecond speed as critical for effective therapeutic PEMF applications. This has now been proven by NASA in the largest study ever done on PEMF. Why is NASA studying PEMF? Because astronauts cannot heal naturally from injuries once they leave the earth's magnetic field, so they have to take it with them in a medical device. That's how fundamental this technology is to human health. NASA’s four year study defining speed as the critical pulse factor concluded: "square waves with rapid dB/dt (nanosecond speed) can be used for "growing tissue for transplantation------ restoring tissue after trauma------and mitigating some neurodegenerative disorders". They found nanosecond technology "capable of stimulating classes of genes associated with cell growth and restoration in a no way marginal manner". EMpulse nanosecond technology operates from 1,000 to 1,000,000 times faster than other PEMF devices on the market, and even those used in reported medical studies. Standard usage varies, but Em-Probe Technologies recommends 30-45 minute applications 1-3 times per day. "Aim" the red light (treatment Zone) at the area of discomfort. Lightly contact the skin or coverings such as light clothing. Do not use Empulse with a pacemaker! In an unhurried manner, move the Empulse back and forth across the area of discomfort. If you see no improvement in 3-4 days, consult your healthcare provider. 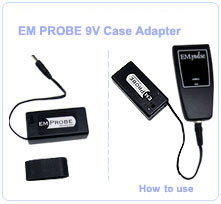 For more detailed use, see user guide provided with your Empulse. 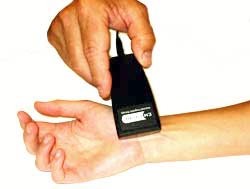 Note: You may feel tingling, mild aching, or nothing at all during or after use of Empulse. These are not indicators of efficacy or proper functioning of the Empulse. Consult your health care provider as to appropriate activities to resume following the use of your Empulse. Under no circumstances should you or the device be partially or completely immersed in liquid during use or cleaning. It is sufficient to wipe the device with a moist cloth or alcohol wipe between uses. Do not pour alcohol or any other cleaning solutions on the device. While the label may loosen or the print may fade, the above cleaning recommendations will not interfere with the function of the device. The transformer requires no cleaning. Important: Transformer replacements must meet the exact output characteristics of the original as seen on the transformer label. Do not use other transformers with different ratings. What if Empulse doesn't work for me? If, within 30 days of purchase, you are not satisfied with your Empulse results return it to your point of purchase and receive a refund on your purchase price. Proof of purchase is required. Empluse is not intended to diagnose, cure, treat, or prevent specific diseases, injury, or illness and no claims are made. Manufacturer's liability is limited to the return of the purchase price upon return to point of purchase, provided a claim is made within 30 days of purchase. Empulse carries a 1 year warranty against manufacturer's defects with normal use (to be determined at manufacturer's discretion). Contraindications: Not to be used in pregnancy, infancy, or with implanted electronic devices. DO NOT use in water, moist environments (sauna) or when sweating, especially at night. Disclaimer: This Website is for educational purposes only and does not address any specific individual circumstances. No medical advice or recommendations are offered, and no doctor-patient relationship is intended or established. Always visit your own licensed health care provider to obtain medical advice and/or treatment. In particular, your licensed health care provider should always be consulted before using any off-label treatment for a medical condition.